Welcome to the five hundred and first of my blog interviews with novelists, poets, short story authors, biographers, agents, publishers and more. Today’s is with Managing Director of publishing house Apostrophe Books Martyn Forrester. A list of interviewees (blogged and scheduled) can be found here. If you like what you read, please do go and investigate further. Martyn mentions Robert Ford who I interviewed in August – you can read our interview (after Martyn’s please :)) here. Morgen: Hello, Martyn. I’d like to jump straight in and ask you whether there is a genre that sells better than others or that you can’t get enough of? Martyn: Perversely, the genres that sell best aren’t the ones we’re interested in. What we can’t get enough of is literary fiction that conventional publishers can no longer afford to take the risk on – that was our original mission when we launched earlier in 2012. We’re talking experimental, cutting edge fiction like The King Of Spain, by Robert Ford (http://apostrophebooks.com/kingofspain). Robert’s a movie editor, and you can tell by the way he uses his literary cameras. The result is a collection of vivid images that stays in your head a long time after you’ve finished reading. Morgen: I wrote a TV script for the now defunct Script Frenzy in April 2010 and whilst I didn’t enjoy the process (I’ve since converted it into the beginning of a novel) it has made me think more about the construction of visual media. I’m sure there will be writers reading this interview who are looking for a publisher, how can they submit to you? Martyn: Submit fiction to us through Fiction Fast-Track, our new competition in which we publish an e-book voted for by the public every two months: http://apostrophebooks.com/fictionfasttrack (we have just published our first winner). Writers submit their complete novel or collection of short stories, and we upload a sample for the public to vote on. For non-fiction, we take submissions by email. We also hunt down writers ourselves, often by sampling self-published works. Part of our aim is to give new life to books we’ve loved in the past. In theory these should be easy enough to track down, but it’s often taken a lot of detective work to trace authors. Finding exciting new work is becoming easier by the day. We’ve even had some coy approaches from agents who like the idea of launching their authors’ new work in ebook format. We have an ebook coming out later this year whose author has been on the New York Times bestseller list many times – their Madison Avenue agent specifically wanted a boutique ebook publisher, and we’re thrilled he chose us – especially as we don’t pay advances! The ebook market is maturer in the States, and agents and publishers have been able to see that the ebook and hardback markets don’t cannibalize each other – they cross-fertilize. I see a rosy future in which we all happily co-exist. After all, part of our mission is to find conventional hardback / paperback homes for our new authors – if we love their writing enough to publish it, we want to see them reach as wide a readership as they possibly can. Morgen: I’d say only a handful of people I’ve spoken to / interviewed only read eBooks. I see them running alongside each other quite happily, in fact I know of readers who have both… of the same book! (if it’s good enough of course) Can you suggest some do’s and don’t’s when submitting to you. Martyn: Please make sure your work has been edited, even if it’s by a friend. Spelling mistakes and poor grammar make our teeth itch. It’s like singing out of tune at a music audition. Morgen: The X-Factor factor of publishing. 🙂 Are there authors that you deal with on a regular basis and / or perhaps represent directly? Martyn: We have been asked to represent authors, but being an agent is a full-time job. Informally, we’re happy to get great work we’re publishing in front of the right people in the right agencies or conventional publishing houses, but after that we’ll step back. Morgen: Again most authors I’ve spoken to appreciate that the emphasis is on them to do the marketing, “a necessary evil” some have called it. You mentioned your competition, do you think they help with a writer’s success? Martyn: I think competitions can be a fantastic springboard. Any contest open to public vote can be skewed by a contestant’s friends and supporters, but by and large you can tell how well a book is going to do. Robert Ford’s The King Of Spain attracted a lot of votes and positive comments, and sure enough it went straight in at Number 1 on the iTunes New & Noteworthy feature. I think the book and author get a lot of publicity they wouldn’t have otherwise. The media like reporting competition winners – look at the coverage The Orange Prize winner got this year. The launch of Fiction Fast-Track was reported as far afield as the San Francisco Chronicle and the Times of India, and internationally on Yahoo. Morgen: Don’t you just love technology (I’m so grateful I grew up with an older brother). You spoke of agents earlier, do you think an agent is vital to an author’s success? How would you suggest an author gets one? Martyn: Between us, we’ve been in publishing for 30 years and we know how tall the slush piles are in most publishers’ offices. Mind you, they are in agencies too. In general, get yourself a good agent and you’re home and dry. Not because of the money – these days, you’re very unlikely to receive an advance that lets you give up the day job – more in terms of editorial advice and guidance. An experienced agent has a price beyond rubies. Morgen: Most of the authors I’ve spoken to who have them would say the same. Now for, in theory, a simple question: what’s your opinion of eBooks, do you publish them and do you read them? Martyn: We love them – we only publish ebooks! And Amazon have just announced that their customers are buying more Kindle books than print books, both hardback and paperbacks, so it looks like we’ve made a good decision to only publish ebooks. So far in 2012, Amazon say that for every 100 print books sold on the site, it has sold 114 Kindle books, excluding free Kindle books. What’s most encouraging, though, is the news that in the UK, Kindle readers buy four times the number of books they did before owning a Kindle. As long as people are involved in the magic of reading, does it matter whether it’s via an iPad, a hardback or a cereal packet? Morgen: I had heard that. Mine are only eBooks (so far :)). Poetry and short stories are, in my opinion anyway, the two most hard done by genres… what do you see as the future for them? Do you think the eBook revolution will help given that eBooks seem to be getting shorter? Martyn: I see a huge future for them. We are bringing out a stunning poetry collection in September, and if it’s successful, we’ll look to establish a list. We’ve already published our first collection of short stories, Pork by Cris Freddi (http://apostrophebooks.com/books/fantasy/pork) ­– a powerful and unusual collection of animal stories for adults. We’re on the hunt for good short stories. A lot of people write one or two good ones, but not enough to fill a collection. Morgen: As a short story author, that’s great news. 🙂 Is there a plot that’s written about too often? Martyn: There is now – it’s the 50 Shades plot, or as we call it, Boy Beats Girl. Morgen: Ah yes. It’s like vampires, it goes in and out of fashion although Dracula has always been popular. Writers should write what they want to, there will be a market for it somewhere. I loved your music audition analogy earlier, do you have to do a lot of editing to the stories you accept or is the writing usually more or less fully-formed? Martyn: We expect submitted work to be already edited, but no work is perfect and there are always a few tweaks we can suggest. Morgen: For your purposes, does it matter what point of view a story is written in? Have you ever printed any in second person? What’s your opinion of second person? Martyn: Not a fan of the second person. Mind you, books written in the present tense don’t float our boat either but you still see plenty of them, so what do we know? Morgen: <laughs> Although second is my favourite point of view, and I write a second person story every Friday for my 5pm fiction slot, I’m sensible enough not to write anything long in it. It’s wearing as a writer and reader. Have you had any surprising feedback about any of your published works? Martyn: It’s cheesy to say this this, but the greatest feedback comes when writers we admire choose to come aboard. Morgen: Flattering for sure. What advice would you give aspiring writers? Martyn: It’s obvious, but: keep writing. Monica Dickens used to spend the first two hours of the day writing furiously, and then she’d throw it away and start her working day. It’s the same for aspiring writers. Just because you wrote it, doesn’t make it good. The very least you can do is cut the first three paragraphs of your first chapter. And then, as Elmore Leonard says, cut the stuff people don’t read. Morgen: Absolutely, start with the action, although I don’t throw anything away regardless of how bad it is because I like to think it can be whipped into shape, or if not it shows me where I’m going wrong or how far I’ve come when it’s finished. Regardless of what you write, you can’t edit a blank page. Martyn: The other thing is, don’t be afraid to expose your work to criticism. If you’re worried about showing your work to others, it’s probably for a good reason – it most likely needs another edit. Be brave and send your work out to publishers, and enter it in competitions – of course we’d suggest Fiction Fast-Track as the first port of call! Morgen: Of course. 🙂 What do you think the future holds for a writer? Martyn: I think we’re in danger of heading for a world where you have to be able to afford to be a writer, like the gentlemen scientists of the 19th century. That’s why Apostrophe Books is trying to incubate and showcase great new voices. It’s not a money making mission; it’s a labour of love. Morgen: I’ve not charged for anything on this blog and therefore not made a penny out of it but it’s part of me (some of my writing friends have called it an obsession and I’d agree with that, about writing certainly). I’d say that’s what it has to be for everyone in this industry. Martyn: For the last couple of years now, the big mainstream publishers have been caught in a perfect storm of high overheads and dwindling sales. They are having to concentrate their resources on their surefire franchises, and it’s being left to independent publishers to champion new writing – look at the number of independent publishers on this year’s Booker long list. Hardback indie publishers tend to have been set up with good intent and decent war chests, and they can fill the void – as long as the good intent and war chests hold up! The costs, and therefore risks, to us as ebook publishers are much lower – not least because all the elements like cover design, formatting and proofreading can be bought out. Morgen: Absolutely. It cost me nothing but time to put mine online and it was a fun process. What do you think of social media sites such as Facebook and Twitter, and more business-related such as LinkedIn? Do you think they’re invaluable or too time-consuming? Martyn: Social media sites are really important these days, but it’s easy to fall into the trap of thinking that because you have a lot of followers, you have a lot of buyers. It’s not the same thing. We use Twitter (@apostrophebooks) and Facebook (www.facebook.com/apostrophebooksltd) to update our followers daily and to reach new readers – and new writers. 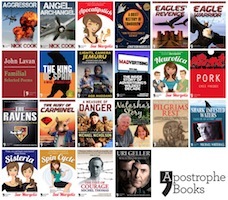 We’re also on LinkedIn, and starting to build a presence on Pinterest (http://pinterest.com/apostrophebooks). Join us! Morgen: I’m pretty new to Pinterest but have heard good things about it so I will have to check you out. Thank you, Martyn. Thank you so much for such an informative post. I’m trying to read everything on your blog at least once a day.